About VEDA Festival: VEDA festival is a knowledge festival, which is a first of its kind in New Zealand. The term ‘VEDA’ means ‘knowledge, wisdom’ and comes from the Sanskrit root word ‘vid’ which means to ‘to know’. The festival endeavors to bring together experts, thinkers, intellectuals and practitioners to share the deeper truths about life and its mysteries. Unique feature: A unique feature of this knowledge festival is its focus on living-wisdom which is a lived experience rather than just knowledge. This festival is in its second year and is already gaining attention from all sections of our society, as more people seek expert wisdom of the experts and their time-tested knowledge. What topics are discussed? Last year, in 2018 the festival theme was ‘KARMA’, which is one of the most intriguing and misunderstood concepts today. This year in 2019, the theme is ‘DHARMA’ which has been the core value of the Eastern civilization for centuries till today. Aims of the knowledge festival: The festival aims to provide our communities a dynamic 21st century platform to gain the wisdom of the experts who follow a scientific, intellectual and spiritual templates of thought. The festival will also provide a platform to share, research and gain more clarity on the deeper topics of life and concepts related to life. To decode this concept, we are inviting experts from the field of psychology, parapsychology and philosophy. The expert practitioners will contribute in panel discussions, conduct workshops on practices that offer roadmap for our lives. 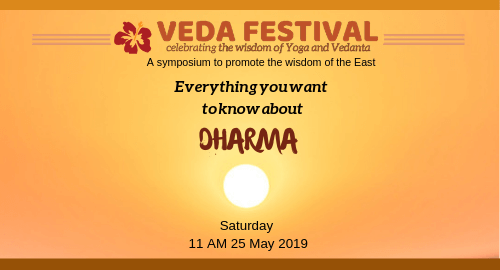 Who are the speakers: The VEDA festival is a celebration of the ancient wisdom and knowledge of life, brought out through the medium of a symposium, where different viewpoints and perspectives will be shared by experts, scholars and practitioners. A knowledge festival of this nature endeavors to bring together experts, thinkers, intellectuals and practitioners to share the deeper truths about life and its mysteries. This festival aims to bring the benefits of promoting life wisdom to the wider community. It is being organized on a not-for-profit basis by Chinmaya Mission New Zealand to spread the benefits of the time- tested science of life which has benefited many civilizations for centuries.